I hope this email finds you well on this snowy and rainy Sunday evening. Please commute safely tomorrow! I am delighted to be returning to the Dorot Center on the Upper West Side to teach a special series – “Gentle Ballet for 60+”. The full description of this new weekly class (Tuesdays 10-11 am) is below. Ballet had been an integral part of my life since I was a child. I started taking classes and performing in recitals as a young child in New Jersey, and then auditioned for and was accepted into George Balanchine’s “School of American Ballet” at Lincoln Center. Performing with the New York City Ballet as a young dancer in classics, such as The Nutcracker, Coppelia, Midsummer’s Night Dream, Harlequinade and others was a gift that I will always cherish. I so appreciate that I was able to dance at The New York State Theater with ballet superstars Suzanne Farrell, Baryshnikov, Helgi Tomasson, Jacques D’Amboise, Patricia McBride, Merrill Ashley (to name a few) as they were coached by Balanchine. It truly was the heyday of ballet in NYC, if not the world, and I soaked it all in. After high school, I joined the Pennsylvania Ballet Company in Philadelphia, dancing professionally for several years. Growing up, ballet was my deepest passion. I never imagined my beloved career would be cut short. But various factors (injury, emotional burnout, immaturity) led me to leave the dance world for a decade to pursue academics and a law degree instead. I thought the ballet for me was just a memory. But while studying for the bar exams, I went back to the other “barre” as well and returned to ballet classes. It was like coming home. Since then, I never stopped dancing; even while practicing law, I would hop on the express train and take class during lunch or after work. When I left the practice of law and became a teacher of yoga, pilates and Qigong, it was only natural that the appeal of ballet teacher trainings would follow, and I subsequently trained with ballet master Finis Jhung (my ballet mentor to this day) and American Ballet Theater’s school. While now teaching ballet to children, adults and seniors, I love to bring joy of movement combined with technical skills – modified to students depending on age and ability. One is never too old to start dance classes, as long as the class allows for the student to respect the body’s limitations and work within safe ranges of motion, as are my guiding principles. Ballet is a beautiful art form that also has practical benefits for students: increase of strength and flexibility; improvement of balance and coordination; focus, attention and memory can improve. Plus, it feels wonderful to move to classical movement. It truly uplifts the spirit! Stretch and strengthen like a ballet dancer, and learn ballet barre technique in a modified gentle ballet class that uses a chair for support. We start with seated warmups for legs and arms, and gentle core strengthening. Once the body is warmed up, we will stand holding the chair for the traditional ballet barre exercises. Ballet class has been shown to improve coordination, balance, flexibility and muscular strength – all while moving to beautiful classical music! Please rsvp to Shannon O’Connor before class and note the standing movements are best wearing ballet slippers, socks with traction, or flexible sneakers (i.e., allowing the feet to flex and point). Tai Chi Easy™ and Chair Yoga continues at the beautiful Integral Yoga Institute. This fusion class supports the immune system with gentle movement, energy work, and self-care techniques. Our practice combines all the above, as we warm up, strengthen and stretch the body with Chair Yoga exercises, standing balancing poses (optional use of the chair for support), Tai Chi Easy™ weight shifting and walking for balance and coordination, and Qigong energy cultivation. Class ends with an extended yoga nidra deep relaxation and guided meditation to refresh the body and spirit. 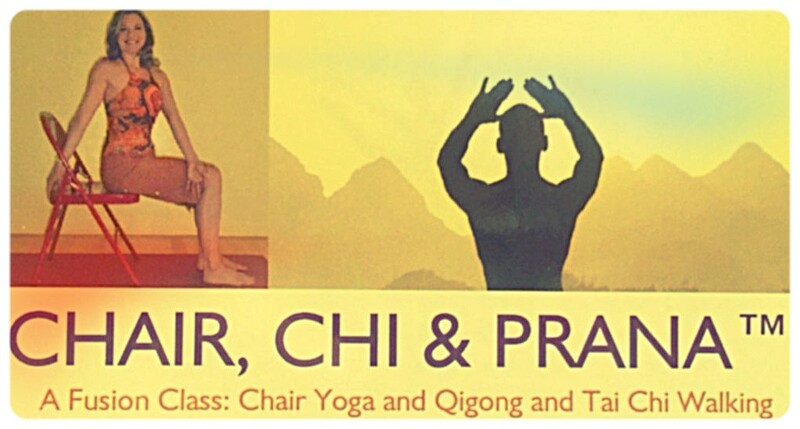 This class, formerly called “Chair Chi & Prana“, is accessible to all ages and levels. Please wear or bring traction socks (like pilates or Barre socks). On this balmy Superbowl Sunday, it feels like Spring may be right around the corner, and I certainly hope so! 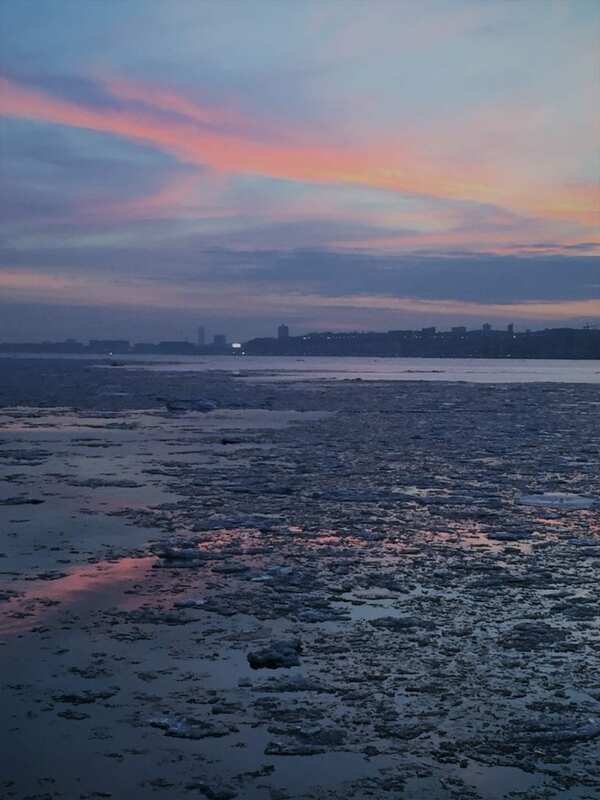 This week’s Arctic Blast left my body feeling stiff and tense, as I found myself bracing against the chilly winds on my daily walking commutes. During the Winter months, it is even more important to take time for stretching and relaxation, as our muscles reflexively contract in the cold and it is mentally exhausting dealing with such inhospitable conditions. This month, I am teaching numerous styles of movement modalities all of which will assist with such gentle stretching with a meditative focus. See the side bar for the February dates and below for descriptions of Adult Beginner Ballet; Chair Yoga & Tai Chi Easy™; Gentle Hatha Yoga; and a special Gentle Yoga & Qigong for Heart Opening on Valentine’s Day. Hope to see you in class! As always, email me any questions you may have about these classes. 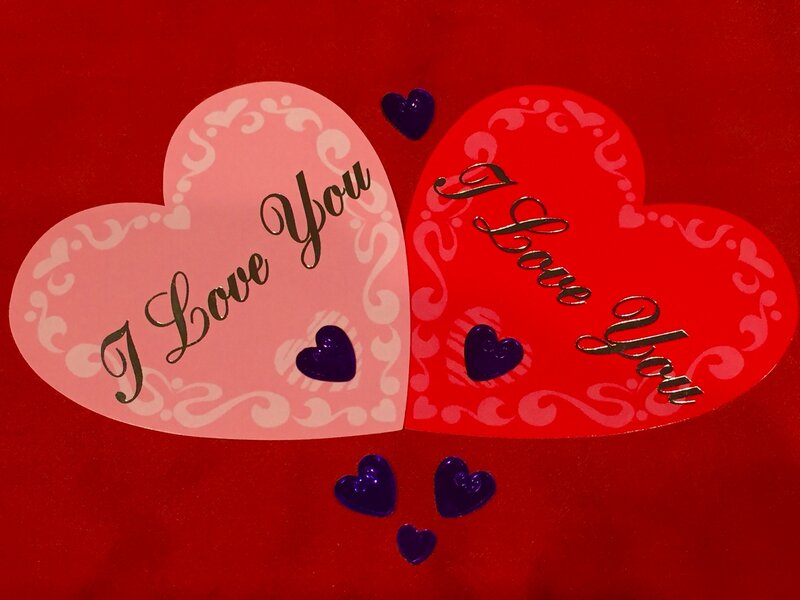 On this 2019 Valentine’s Day, you are invited to a special Heart-focused Yoga & Qigong class 5:15 – 6:45 pm at Integral Yoga Institute. Qigong and yoga are heart opening practices, opening to our own hearts as well as to others. Yoga and Qigong cultivate acceptance and non-harming (Ahimsa) towards oneself and others. In this special class, welcome to everybody (all genders, singles/ couples), we will collectively and individually create more openness of body and spirit as we practice asana and energy work with a gentle heart-centered intention. This fusion class combines gentle movement, energy work, and self-care techniques. Our practice will include all of the above, as we warm up, strengthen and stretch the body with Chair Yoga exercises, standing balancing poses (optional use of the chair for support), Tai Chi Easy™ weight shifting and walking for balance and coordination, and Qigong energy cultivation. Class ends with an extended yoga nidra deep relaxation and guided meditation to refresh the body and spirit. This class, formerly called “Chair Chi & Prana“, is accessible to all ages and levels. Please wear or bring traction socks (like pilates or Barre socks). This class is open to all, whether you have ballet experience and want to review the basics or you are a brand-new beginner. Non-dancers will not be intimidated as the instructions are clear and the class moves at a slow pace. You will begin standing at a portable barre placed in front of the mirror. Most exercises are done with both hands on the barre and proceed slowly and methodically, and the second time you will practice away from the barre so you develop balance and strength. In Ballet Level 1, students learn the basics of correct dance posture, positioning, and balancing on one leg. Your muscles will develop properly so you gain strength and control of your movements. The centerwork includes stretching on the floor, as well as basic dance movements which travel across the floor. Ballet helps with increasing coordination, balance and memory, and movements are coordinated with beautiful classical music. 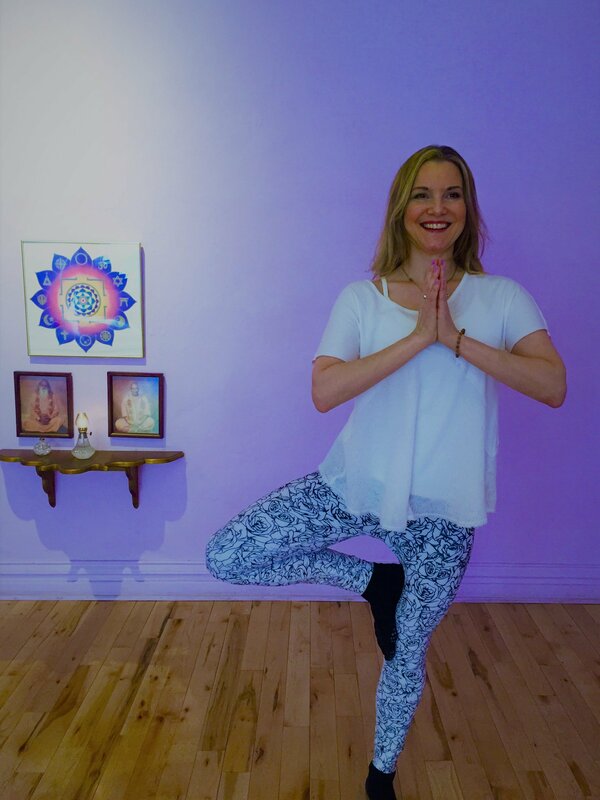 Restore your balance in this gentle Hatha yoga class that focuses on proper alignment and inner awareness during each yoga posture, deepening the meditative aspect of the yoga practice. This class is designed as a moving meditation that helps us slow down our thoughts so we can connect to our true essence – our higher self. We begin with the Integral Yoga chants and eye exercises, before exploring the yoga asanas allowing for modifications for each practitioner if appropriate. Class includes a guided yoga nidra (deep relaxation technique) and savasana (relaxation pose) leaving us feeling refreshed and rejuvenated. We conclude with breathing exercises (pranayama) and meditation, as well as the Integral Yoga peace chants – creating a well-rounded and thorough yoga practice suitable for all levels, from beginners to advanced practitioners. 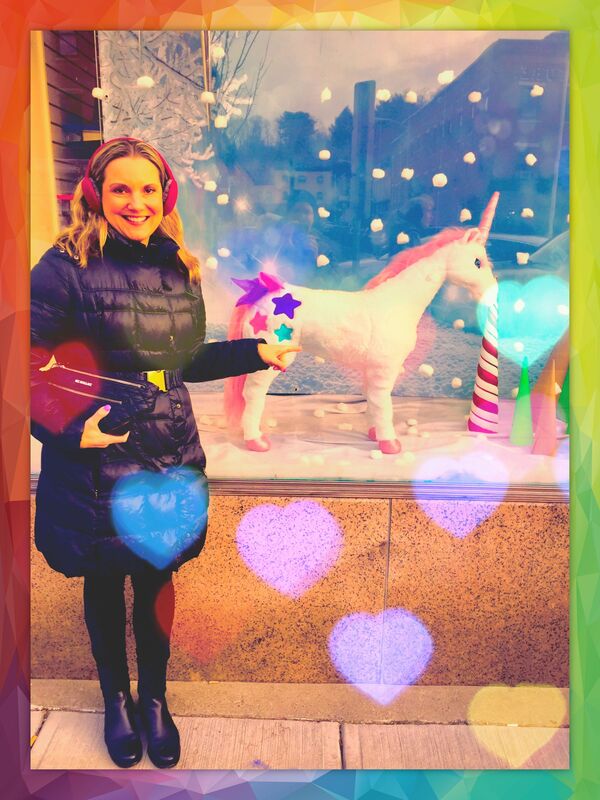 Wishing you a magical and wondrous New Year filled with happiness, harmony, and abundance! Often as we think about our plans or resolutions for a new year, we have been conditioned by society to create unrealistic or onerous resolutions, such as to lose 15 pounds in a month or eliminate sugar or “bad” carbs completely. Perhaps there are some who will be able to succeed in their quest and maintain such a rigid restriction or goal for the long term. But most such resolutions get broken fairly quickly, creating more disappointment and negative self-talk for the goal seeker. However, if we can flip the resolutions so that they are not about removing something desirable from our lives (let’s be honest, sugar tastes delicious! ), but instead is about adding things (such as, I will eat more fresh fruit and veggies), we won’t feel the same level of deprivation. By focusing on the positive side of a new dietary lifestyle (note, I did not use the word “diet”), we will not feel as if we are on punishing ourselves – as we eliminate the things have been used to eating or craving. Instead, it is more likely that if we add more nutrients and fiber from fresh fruit, berries and veggies, for example, we probably won’t be craving as much sugar or unhealthy carbs. Psychologically, we are adding to our lives – not detracting – which is very different than a resolution that focuses on depriving ourselves. As soon as we vow to not have something anymore, ironically it becomes all that we seek. I used the sugar issue as an example, but there are so many more examples of how we can create positive goals instead of punitive ones. Let’s say we want to spend less time on our electronic devices, social media, tv, etc. If that is our resolution, we are likely to go through withdrawal, experience FOMO (fear of missing out, especially in these politically charged times). But instead, what if our goal was to add activities such as going to more museums, plays, concerts, yoga and dance classes, walks in the park? We reward ourselves with these positive lifestyle changes and as a secondary consequence, it is likely our screen time will diminish without any feelings of deprivation or loss. So in this 2019th year, let’s ask ourselves what we would like to add into our lives that makes us feel inspired, excited, healthy, and optimistic! What are the things we experience that uplift us and what do we find energetically draining? Take some time to create two lists noting this, and after a week or so of adding to the lists, reflect upon the answers. Can we find a way to nourish ourselves by increasing the things we now explicitly see uplift us? Now, that’s a New Year’s resolution I can make and stick with! I hope to see you this Monday night at our first Tai Chi Easy™ and Chair Yoga class of the Winter semester at Integral Yoga Institute. 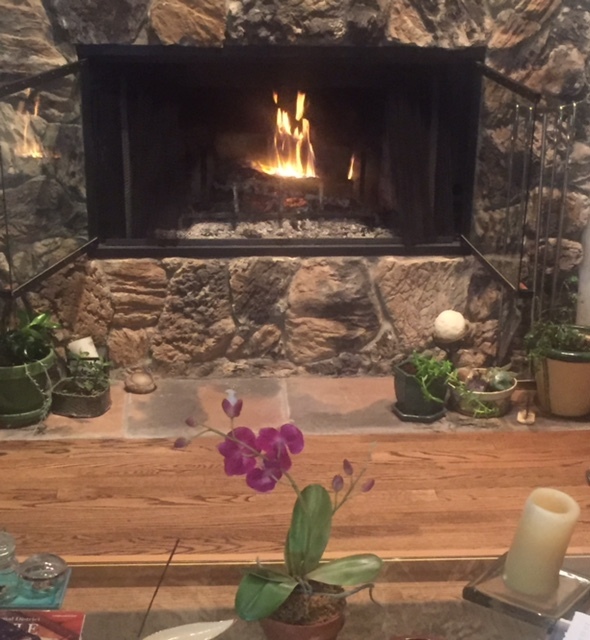 The chilly Winter season is a time when it is tempting to hibernate in one’s abode, but is important to continue to support the immune system with gentle movement, energy work, and self-care techniques. Our practice will include all of the above, as we warm up, strengthen and stretch the body with Chair Yoga exercises, standing balancing poses (optional use of the chair for support), Tai Chi Easy™ weight shifting and walking for balance and coordination, and Qigong energy cultivation. Class ends with an extended yoga nidra deep relaxation and guided meditation to refresh the body and spirit. This class, formerly called “Chair Chi & Prana“, is accessible to all ages and levels. Please wear or bring traction socks (like pilates or Barre socks). 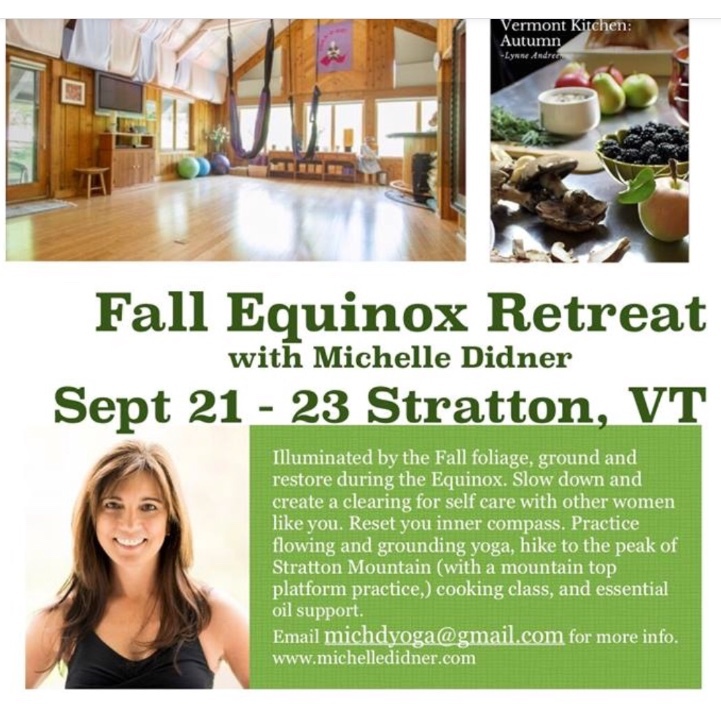 See below for my Fall classes and also for information on my cousin Michelle’s Fall yoga retreat for women in Vermont! Sounds heavenly! As part of Falls Prevention Week at Dorot, this workshop is a part-lecture, part-exercise class. Shannon will introduce tips to prevent falls and become more mindful when moving throughout your home or the community. Melissa will teach Tai Chi Easy™, a simplified yet practical version of Tai Chi created by Roger Jahnke, O.M.D. Learn weight shifting exercises (and starting with Melissa’s chair exercise warmups), to gain confidence and leg strength. This Tai Chi Easy™ class will include standing while holding the chair for support and weight shifting, but not tai chi walking. Focus in motion with us! 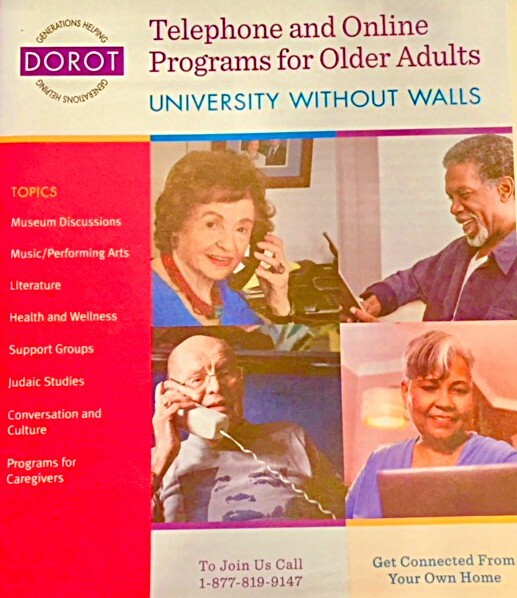 Check out DOROT’s Wellness Program! I hope you are having a wonderful Summer! This Monday night is our final “Chair Chi & Prana” of the season, and I hope to see you there at the beautiful and peaceful Integral Yoga Institute. After July 16, there will be a short break for August, and I will be looking forward to resuming this class in the Fall. (When the Fall dates are confirmed, I will email you as well.) See below for more details on this Monday’s class; you may sign up at http://www.iyiny.org or simply sign up as a walk-in. Enjoy the rest of your weekend, and hopefully I will see you tomorrow! 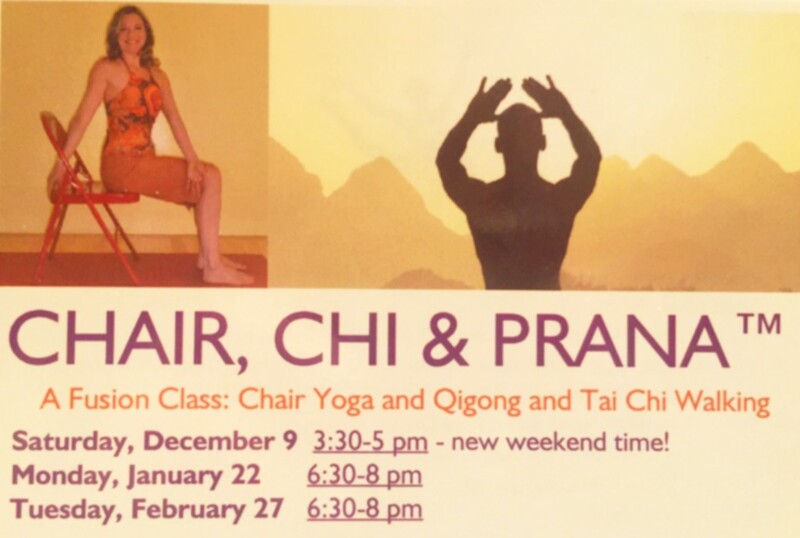 Chair Chi and Prana is hosted by the beautiful yoga center – Integral Yoga. This fusion class increases our vitality, and improves balance and coordination by combining Chair Yoga, Qigong, and Tai Chi Easy™ walking. Seated and standing Yoga poses strengthen and stretch the body, gentle and flowing Qigong movements enhance our life force energy (chi or prana), and Tai Chi walking increases balance and helps with fall prevention. Additionally, these practices are a moving meditation that calm the nervous system, increase immune support, focus the mind, and are accessible to all bodies and ages. We end class with a long savasana and yoga nidra (deep relaxation) to fully relax and absorb the benefits of our practices. All levels are welcome! No prior experience is necessary. Hope you are keeping your cool and comfort in the midst of this Northeast heat wave! Please stay hydrated! 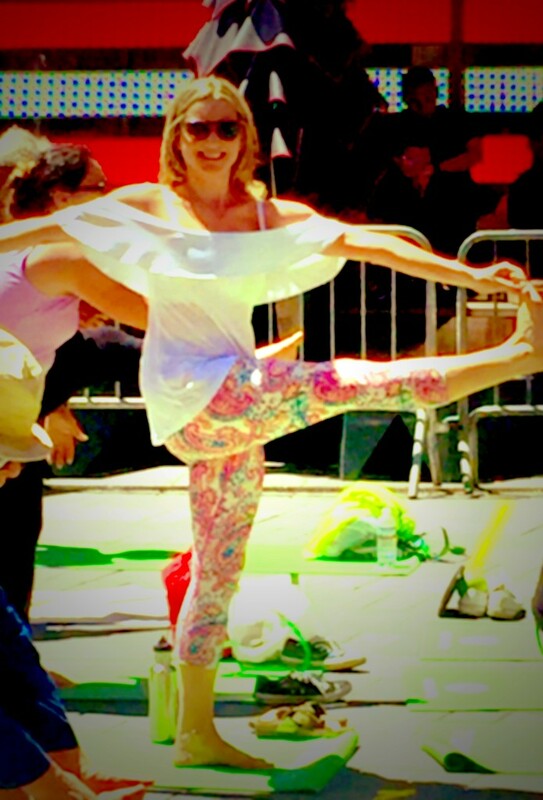 Speaking of heat, once again I attended the uniquely NYC “Summer Solstice Yoga” in Times Square. 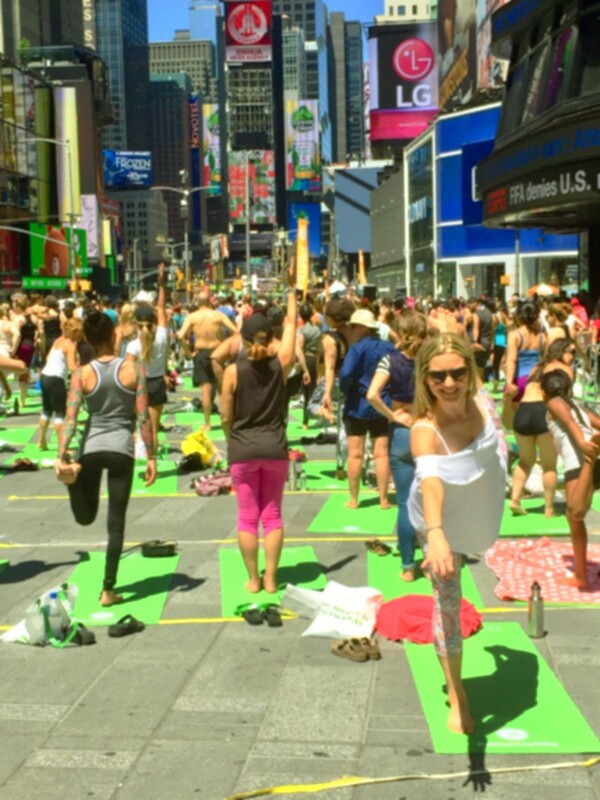 This year, over 12,000 participants attended yoga classes throughout the day as Times Square was shut down to vehicles, and turned into one large outdoor yoga studio. Attendees were generously given yoga mats by Aerie and the Times Square Alliance, and we literally placed our mats in the center of the city (or the world, depending on your NY-centric perspective!). Participants braved the high temperature, curious onlookers, photographers, and different styles of yoga to join with New Yorkers of all ages, sizes, colors, and backgrounds to create a beautiful mosaic of humanity. Times Square Solstice Yoga is always one of my favorite events of the year as I find it uplifting being with so many others practicing yoga in such a large communal way. Even in the midst of chaos and busy urban activity, the practice of yoga prepares us to go inward no matter the external environment. What better way to test that precept during a packed mid-day yoga class in Times Square! If we can literally balance and focus in dancer pose and other challenging asanas in the middle of 42nd Street, we know that with practice and intent, we can stay steady outside of yoga class no matter the circumstances. During these chaotic and anxiety-provoking times.our daily connection to that deep inner core within each one of us is so necessary for maintaining balance and finding inner peace. Yoga, meditation, qigong, tai chi, dance, nature walks, creating art, gardening, shamanic journeying, writing, playing music, jogging are some ways during which we can go deeply inward. What do you find works best for you in this moment? Has that changed throughout your life, or has it remained a consistent path? Enjoy the process and the journey! 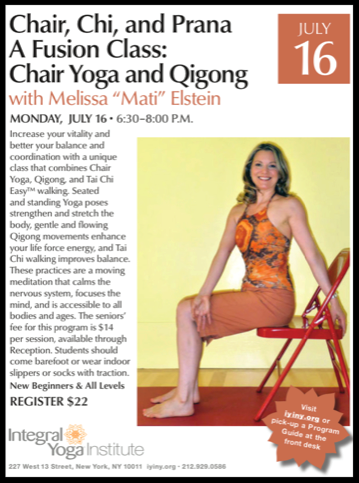 This month, my yoga-qigong-tai chi fusion class (“Chair Chi & Prana“) will be held on July 16th at the beautiful Integral Yoga in the heart of the West Village. Much of the qigong and simplified tai chi that I incorporate into my yoga classes I learned from my first tai chi teacher – Dr. Roger Jahnke. http://www.feeltheqi.com/Dr_Jahnke/ If you would like to meet him in person, there will be a free intro evening at NYC’s Open Center on Thursday, July 5th: https://www.opencenter.org/awakening-healer-within I hope you can attend that event this holiday week! 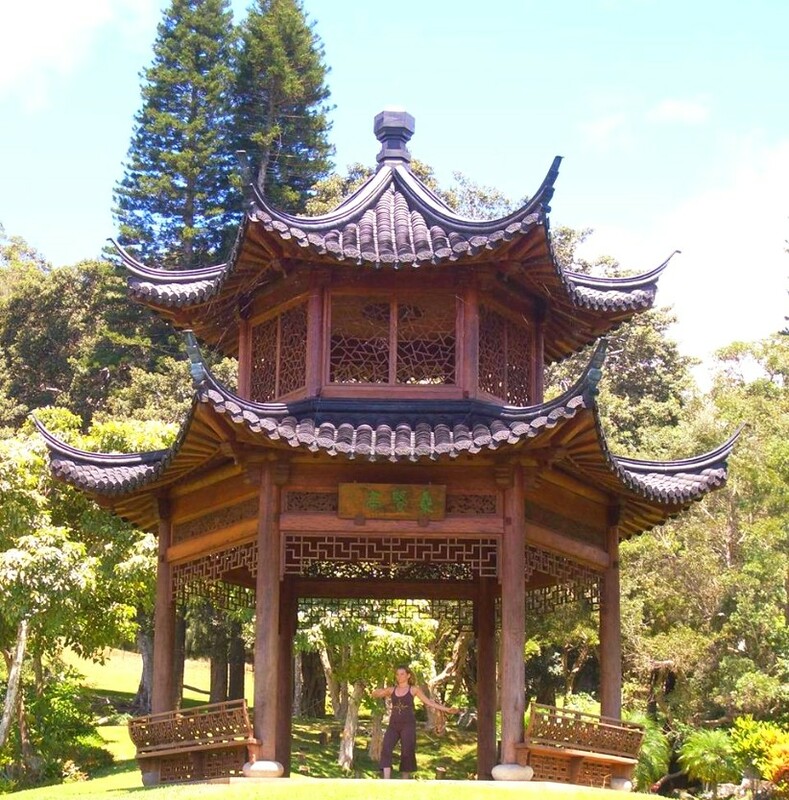 Dr. Jahnke created “Tai Chi Easy”TM – the system of tai chi, qigong, self-massage that I studied at the Omega Institute in 2007. http://www.healerwithinfoundation.org/taichieasy It was a fantastic training, and to this day, it is the style that I primarily teach and practice. It is very accessible to all ages and levels of experience, and as you can see from our facilitator graduation photo, we had a fun and diverse group. http://instituteofintegralqigongandtaichi.org/calendar/ I highly recommend doing one or more of his trainings! I hope you are having a lovely June! 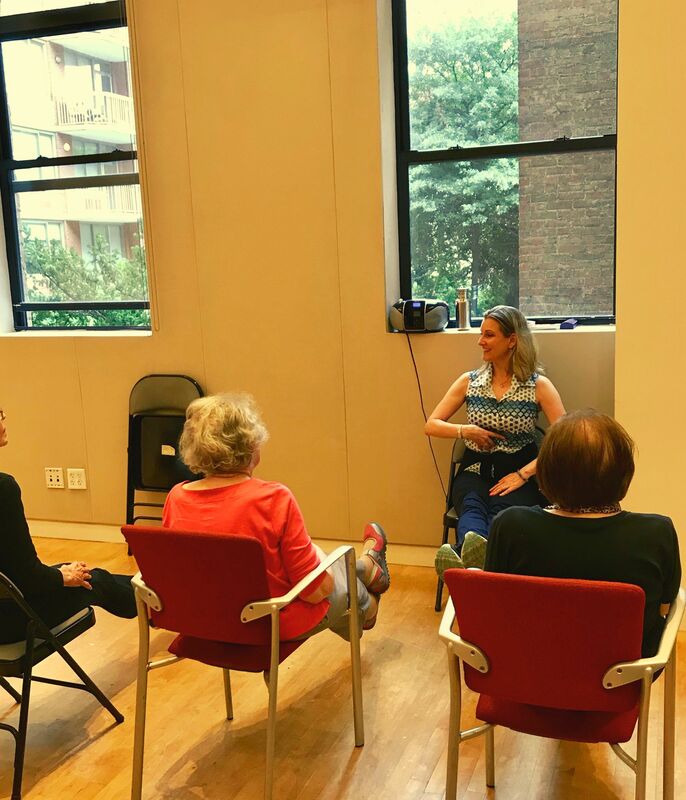 This month, in addition to my monthly Integral Yoga “Chair Chi & Prana” workshop, I am back teaching at Dorot for Seniors and Bloomingdale Aging in Place (“BAIP”), and look forward to reconnecting with my students there. Many of you inquire about the qigong and simplified tai chi that I incorporate into my yoga classes, and I always recommend my first teacher – Dr. Roger Jahnke. http://www.feeltheqi.com/Dr_Jahnke/ He directs the Health Action Clinic in Santa Barbara, CA and is the founder and creator of “Tai Chi Easy” – Dr. Jahnke’s system of tai chi, qigong, self-massage that I studied at Omega in 2007. http://www.healerwithinfoundation.org/taichieasy and It was a great training, and to this day, it is the style that I primarily teach and practice. It is very accessible to all ages and levels of experience, and as you can see from our facilitator graduation photo, we had a fun and diverse group. http://instituteofintegralqigongandtaichi.org/calendar/ In fact, there will be a free intro evening at the Open Center on July 5th: https://www.opencenter.org/awakening-healer-within I highly recommend doing one or more of his trainings! Wishing you a very happy holiday weekend! This weekend brings us Easter, Passover and a second “blue moon”. A very auspicious time, it seems! 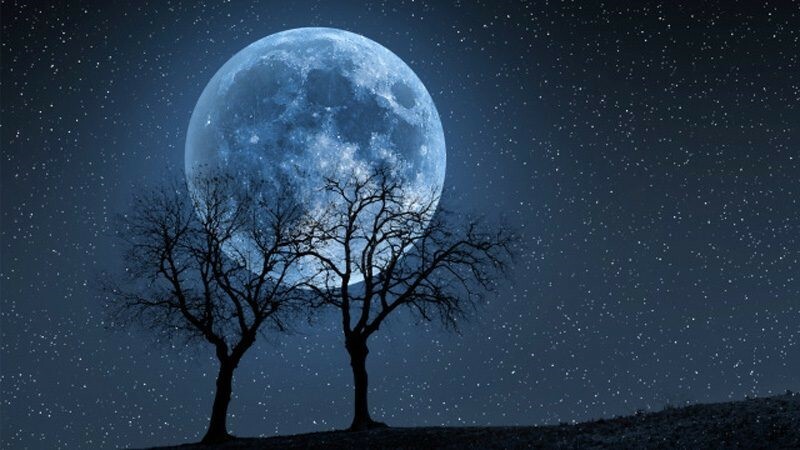 Here is an interesting article, with a beautiful photo slide show, describing this weekend’s phenomenon that also gives us a super blood moon and full lunar eclipse: https://www.express.co.uk/news/weird/938509/Blue-moon-2018-spiritual-meaning-superstitions-astrology Happy viewing! 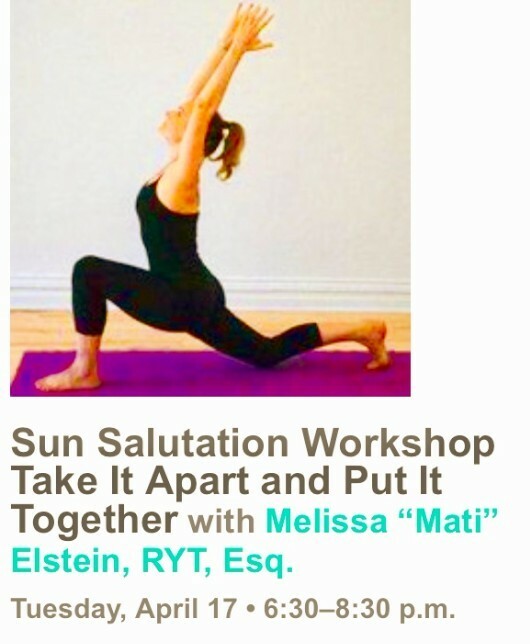 If you have struggled with all or part of the famous yoga sequence, the Sun Salutation, this workshop is for you! Learn each position and transition in the flow with time to dissect it part by part and discover which modifications or versions work best for you. This workshop involves discussion and practice and comes with a take home outline. Bring a pen and your questions, and learn how to flow with ease the next time you salute the sun! 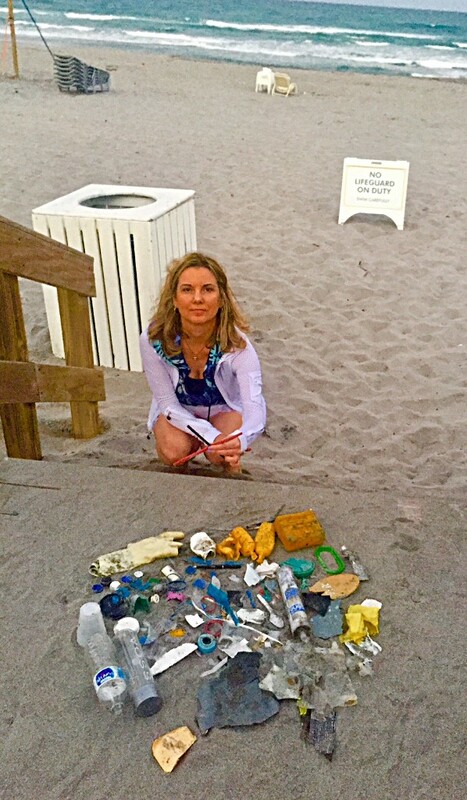 In honor of Earth Day 2018 and its’ focus on plastic pollution, I will be speaking at the Dorot Center for Seniors on Friday, April 27 on “How to Reduce Our Single-Use Plastic Consumption and Why It’s So Important”. I will be joined by marine biologist Dr. Judith Weis; we are both steering committee members of the NY/NJ Plastic Free Waters Partnership. http://www.plasticfreewaters.org Learn about the plastic pollution crisis currently facing our planet, how it impacts all of us, and what we can do to reduce our plastic footprint with easy to implement solutions. It is estimated that at the current rate of plastic consumption, there will be more plastic in the oceans than fish by 2050! Seeking your support! 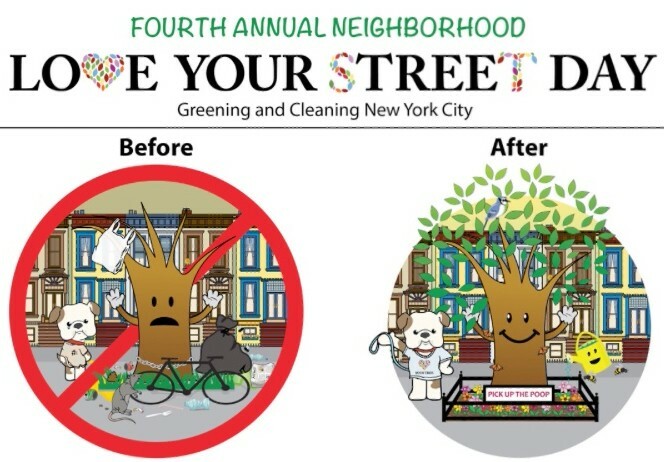 As you may know, I cofounded with a couple other folks, the NYC “Love Your Street Tree” initiative almost four years ago. This initiative is to bring awareness to the importance of caring for our street trees especially now that the city completed its’ million trees planting initiative. As part of our “Love Your Street Tree” project, we provide free educational events at schools and in the community, created and host our Annual “Love Your Street Tree Day” Spring Cleanup and Planting Day every May. This May 20th, will be our 4th year hosting tree loving New Yorkers and providing them with free gardening gift bags that contain all the tools and supplies they will need to take care and steward the street trees in their neighborhood, including our popular double-sided “curb your dog signs” – dog waste being a health issue when it is not properly disposed of (and frankly disgusting when it is tracked into our homes on the bottom of our shoes). At our event, we also teach participants how to properly care for a street tree and do sample demonstrations. This year, our project has been accepted by non-profit crowdfunding site – ioby. This is very exciting, as all donations will be matched dollar for dollar! Your donations will help us purchase the items for our free urban gardening gift bags, such as gardening tools, the curb your dog signs, watering buckets, gloves, plants or seeds – all the items necessary for beautifying the neighborhood and properly taking care of our beautiful and beneficial street trees! You will be emailed a charitable tax receipt. I and our other tree cleanup volunteers will be so grateful! If you can do me a favor and donate this week before our official public ioby launch next week, I would very much appreciate it as that creates important momentum! Street trees help clean, cool and purify our urban air, improve citizens’ physical and emotional health, absorb stormwater thus keeping raw sewage and other pollutants from entering our waterways during storms, increase property and business values, provide shelter for birds, and beautify our city! By the way, when you donate, there will be an ask from ioby to make an optional gratuity to them as well – they are also a non-profit. Just a heads up, in case that is confusing! Thanks again. This short Winter month brings us Valentine’s Day, Presidents’ Day, and Black History Month. It is a month when we tend to long for Spring to arrive, but grudgingly know we still have a couple more months of Winter. So for those of us in the North East, how do we brighten our days and motivate when we are still dealing with snow and ice storms, and frigid temperatures? 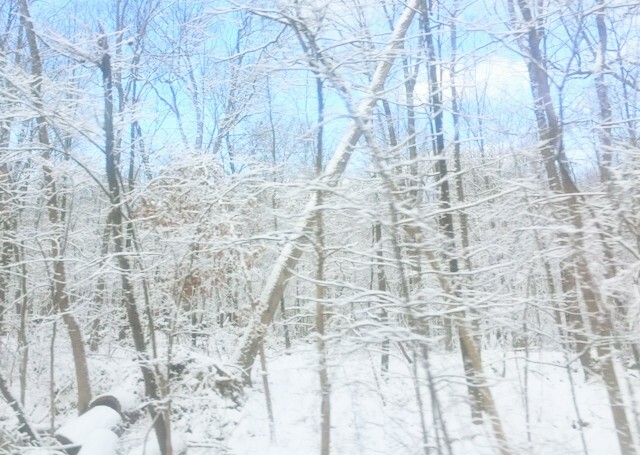 I find myself wanting to hide under a warm blanket with a good book, and hibernate until the Spring thaw. But, given I am not a bear, hibernation is not an option! I find that signing up for group classes keeps me committed to my workouts and my spiritual practices, and the group solidarity helps boost my mood as well (you all can tell by now, I am not a Winter person!). Whether I am teaching a group class or taking one, the group interaction and solidarity is extremely motivating. 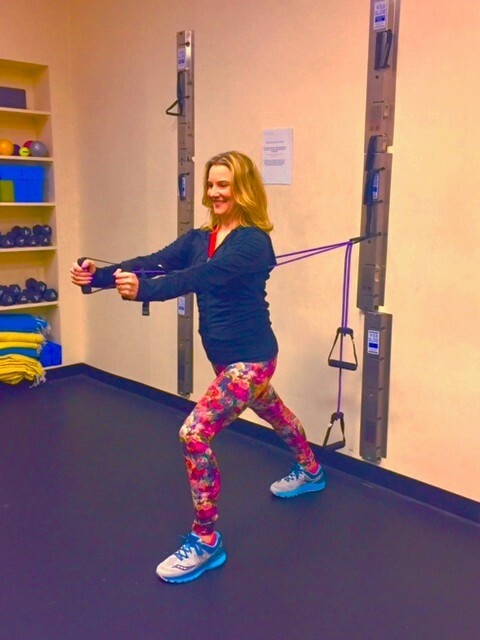 One of the classes I recently signed up for is a fun conditioning circuit class geared towards those of us 50 years of age and up, taught at Silver Stars Fitness (fitness specialists for baby boomers and beyond). http://www.silverstarsfit.com I highly recommend this specialized fitness studio; see below for more details on their classes and training! Last year, I organized at home personal training for my father with a trainer from Silver Stars Fitness so that he could maintain and even improve his strength while he was going through various health challenges. He really enjoyed his workouts with Mary who visited him in his apartment, as he could not commute to the Silver Stars Studio. Mary brought the necessary equipment (like bands and other resistance tools), and because she has specialized training working with seniors, was able to safely teach him strengthening exercises, stretches, and balancing skills. My father raved about Mary, and her visits were one of the highlights of his week! In addition to Silver Stars’ roster of specialized trainers who will do at home training, they also offer small group classes and individual personal training in their beautiful gym located at 7th Avenue and 54-55th Streets. Classes are limited to a maximum of 6 students, so there is much individual attention to form and safety. I signed up for a weekly “30-Minute Circuit” class, which is a lot of fun and a well-rounded workout using weights, bands, balls, and balance boards, and including movement across the floor. This class is offered five times per week, and they also offer a very practical “Balance & Fall Prevention” class. If this sounds interesting to you, you can contact owner Jason Greenspan to schedule a consultation or attend their next Open House: (646) 370-3843 or info@silverstarsfit,com I believe that functional cross training (doing multiple modalities of fitness) is very important, especially as we get older, and that yoga or dance alone is not sufficient for full body conditioning. As that saying goes, variety is the spice of life! Speaking of variety of movement, our next Chair Chi and Prana class will be held on a Tuesday this month – Feb. 27. This class too has a great group energy. 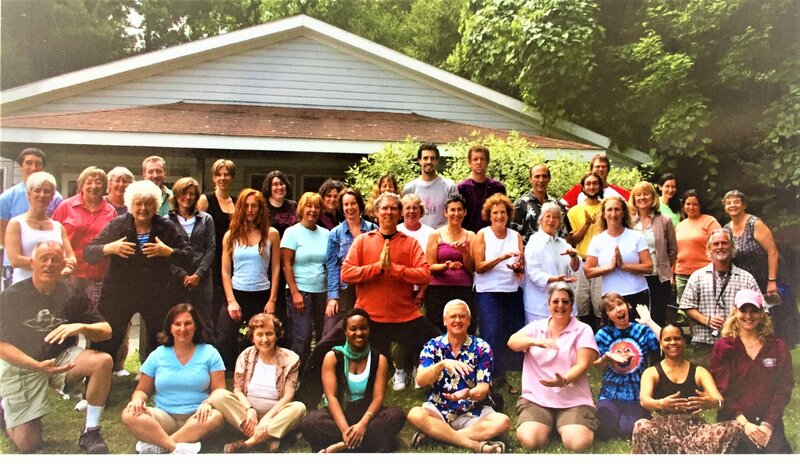 The beautiful and historic yoga ashram Integral Yoga Institute has been hosting this class for many years, and it is accessible to both newcomers as well as experienced students. This unique class is designed to increase our vitality, and improve balance and coordination by combining Chair Yoga, Qigong, and Tai Chi Easy™ walking. Seated and standing Yoga poses strengthen and stretch the body, gentle and flowing Qigong movements enhance one’s life force energy, and Tai Chi walking increases balance. These practices are a moving meditation that calm the nervous system, focus the mind, and are accessible to all bodies and ages. We end class with a long savasana and yoga nidra (deep relaxation) to fully relax and absorb the benefits of our practices. All levels are welcome!